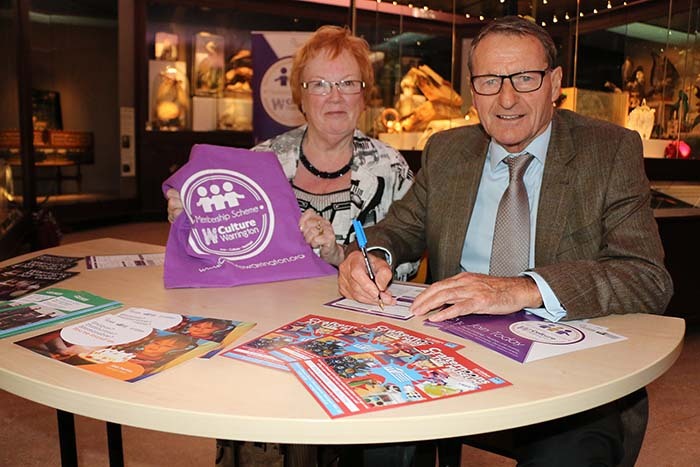 Local Warrington man Roger Hunt, a member of the World Cup-winning England team in 1966, signs up as the first patron of our new membership scheme, with Culture Warrington’s board chair Maureen Banner. Image Courtesy: Culture Warrington. The team at Culture Warrington have always been dedicated to making the town a thriving centre of activity and work tirelessly to promote its heritage, arts and entertainment offer. With lots of exciting future plans to further improve this offer including a new Heritage Hub which will explore the town’s rich history, and a new gallery bringing the best of the contemporary arts to Warrington there are exciting times ahead for the team and its audiences old and new. Emma Sumner: How did the idea of Culture Warrington running a membership scheme come about? Was this something your audience asked for or something that you decided to set up as a source of income generation? Michelle Hill: The main impetus for the set-up of the scheme was the museum being awarded a Catalyst grant from the Heritage Lottery Fund. The aim of the project was to look at making the organisation more sustainable, business-like and resilient following transfer from local authority management in 2012. There were two main strands of the project with one aim – to increase our support base. One part of the Catalyst project focused on launching a revamped Culture Warrington volunteer scheme and the other part was to look at formulating a fundraising strategy through sponsorship, philanthropy and developing a membership scheme. We also wanted to reiterate that Culture Warrington is a charity and because of this there is now an increased emphasis on us raising our own funds and looking for financial support in a variety of ways. ES: What does a Culture Warrington membership give those who subscribe? ES: Since you launched, have you had a good response to the scheme and what has been the uptake? MH: We launched it on 1 July and to date (27 July) we have had more than 20 members sign up. There is a marketing plan in place to raise awareness of the scheme and a working group has been set up to monitor and further develop the scheme. ES: Does Culture Warrington have any future plans to develop the scheme further and if so how do you see it developing? MH: Yes we would like to develop family and corporate membership offers. We decided to start with a couple of membership categories (single and double membership) to see how things go and then we can reflect on progress, examine member feedback and then look at developing the scheme further. We would aim to review the benefits the scheme offers on an annual basis. ES: What would your advice be to any other North West organisations who might want to look into setting up their own membership schemes? MH: Set up a working group of staff representing different parts of the organisation and speak to staff at all levels about suggestions and ideas that have been put forward. Do your research into what other schemes are out there locally and their pricing structure; don’t overprice your scheme. Ask your visitors what they would like to see from a scheme in terms of potential benefits and this should give you a steer. Keep an eye on the benefits offered so you are not giving away more than the income you generate. Have a dedicated person/team of people to meet regularly after the scheme has launched to keep it high on people’s agendas. As with all projects once they have launched, it’s easy to let things drift as staff move onto other projects. It was very useful for us to have an external consultant Marilyn Scott (director of the Lightbox in Woking) who has extensive experience in this area to guide us but obviously not everyone has the funds to do this. In which case it would be useful to get out and about and speak with people in other organisations that have set up schemes and get their advice about what has or hasn’t worked for them. To find out more about the scheme or to become a member, Click Here.